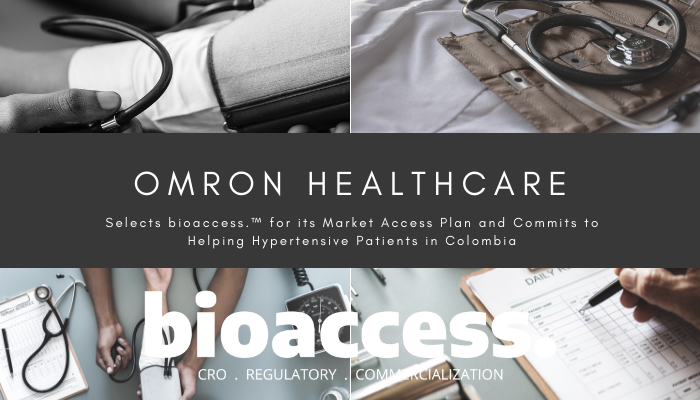 [ORLANDO, FL, July 6, 2018] - Omron Healthcare, Inc. ("Omron") has appointed bioaccess.™ as its market access consultants in Colombia. bioaccess.™ will help Omron formulate a market access strategy and implementation plan in Colombia so that more hypertensive patients have access to Omron's automated home blood pressure (BPM) monitors in Colombia; thus, making it easier for patients to monitor their blood pressure at home and reducing their risk of heart attacks and strokes. This market access plan will greatly help Omron increase the sale of their home BPMs in Colombia. Possibly due to low out-of-pocket costs and lack of education and adherence to clinical practice guidelines, hypertensive patients do not buy automated home BPMs in Colombia. Clinical practice guidelines in Colombia strongly recommend the use of automated home BPMs, however, prescribers don't seem to follow the guidelines, and patients are apparently not aware of the guidelines nor the benefits that they will obtain by monitoring their blood pressure at home. According to Colombia's Ministry of Health statements, the silent epidemic of cardiovascular diseases such as coronary syndrome, thrombosis, diabetes, and hypertension is revealed in the emergency rooms of the health care providers as being directly responsible for the main mortality causes in the country. "The mega goal proposed by the health sector for the past two years has been the reduction of eight percent in preventable premature mortality associated with cardiovascular diseases, cancer, diabetes and chronic respiratory diseases. Here, arterial hypertension plays a fundamental role as the ninth cause of mortality in the country and we have to put an end to this incidence," said José Fernando Valderrama, deputy director of Noncommunicable Diseases at Colombia's Ministry of Health. Mr. Valderrama has also indicated that hypertension is directly responsible for the main mortality causes in the country: heart attack (first place) and stroke (third place). Omron's line of home BPMs have had market clearance in Colombia for over 10 years. Omron has an ample distribution network in Colombia and aims to facilitate patient access to its innovative automated home BPMs. For this, Omron has appointed bioaccess.™ as expert market access consultants. bioaccess.™ will create for Omron a strategic and tactical market access plan to make it easier (and affordable) for patients to monitor their blood pressure at home, thus reducing their risk of heart attacks and strokes. bioaccess.™ will assist Omron in Colombia perform a comprehensive analysis of the market including face-to-face interviews with payers (i.e., health management organizations or EPS' as they are called in Colombia), key opinion leaders, prescribers, distribution channels, and other relevant stakeholders. The market research analysis should explore topics such as device availability, competitive differentiation, key sales drivers, technology preferences, patient needs, etc. This market research analysis will lead bioaccess.™ to formulate the problem statement for Omron in Colombia, and will allow bioaccess.™ produce a market access plan that will include solutions for Omron — thus, enabling Omron to increase its market share in Colombia. Omron Healthcare, Inc. is a leading manufacturer and distributor of personal heart health and wellness products. Omron’s market-leading products include home blood pressure monitors and electrotherapy devices. Since Omron invented its first blood pressure monitors more than 40 years ago, the company has been passionate about empowering people to take charge of their health at home through precise technology. Helping people improve their ability to live a healthier life is the heart and soul of Omron’s purpose. The company recently evolved its mission to Going for Zero, the elimination of heart attacks and strokes. For more information, visit OmronHealthcare.com. bioaccess.™ is a US-based contract research organization (CRO) and consulting company that delivers a full spectrum of clinical research, market access, market entry, and regulatory offerings from bench to commercialization so that foreign manufacturers of regulated products can have long-term success in Colombia and the rest of Latin America.